It should not come as a surprise to find Soft Machine Legacy on the roster of an independent label named after one of the original Soft Machine’s most iconic compositions. The band – the last in a series of Soft Machine offshoots started by bassist Hugh Hopper back in 1978 with Soft Heap – was born in 2004, when guitarist Allan Holdsworth left Soft Works and was replaced by John Etheridge. They released a studio album and two live ones between 2005 and 2006, just before founding member Elton Dean’s untimely passing. Their second studio-based effort, 2007’s Steam, saw renowned flutist/saxophonist Theo Travis (currently also a member of Gong, The Tangent and Steven Wilson’s band) take Dean’s place; the album was also to be the last with Hugh Hopper, who succumbed to leukemia in 2009. In spite of these setbacks, Travis, Etheridge and drummer John Marshall (who had originally replaced Robert Wyatt in 1971) recruited another Soft Machine alumnus, bassist Roy Babbington, and went on to produce their third studio album. Burden of Proof, recorded in Italy at Arti e Mestieri keyboardist Beppe Crovella’s Electromantic Studios was finally released on Moonjune Records in the spring of 2013. Though its name may suggest yet another of the many tribute bands whose popularity often eclipses that of bands performing their own material, Soft Machine Legacy deliver much more than just a reverent homage to one of the most influential bands of the early progressive rock scene. The “Legacy” at the end of the band’s name (even when all of its founders had the legal right to call themselves Soft Machine) emphasizes the continuity between the “mother” band and its offshoots, while ruling out slavish imitation. Bringing together the variegated threads of the history of the band founded by Robert Wyatt, Mike Ratledge, Kevin Ayers and Daevid Allen in the mid-Sixties, the quartet led by John Etheridge have perfected their own original sound. Travis’ own soundscaping system, called Ambitronics, lends the proceedings a haunting ambient component, bringing to mind his work with Robert Fripp, and integrating with Etheridge’s use of loops and other effects to replace Mike Ratledge’s trademark fuzzed organ; while his sparing but effective use of the Fender Rhodes electric piano creates an ideal connection to Soft Machine’s turning-point album, Fourth (their first completely instrumental effort). Featuring 13 relatively short compositions spread over a running time of about 55 minutes, Burden of Proof possesses an internal cohesion of its own. The longer, more structured pieces (between 3 and 7 minutes) are bridged by shorter interludes, mostly improvisational in nature; despite this apparent fragmentation, the music flows effortlessly, and the two “souls” of the album fit together without leaving an impression of patchiness. A stunning rendition of Hugh Hopper’s “Kings and Queens” (from Soft Machine’s Fourth) – strategically located in the middle of the album, and led by Theo Travis’ melodic, melancholy flute meshing with Etheridge’s measured guitar – functions as a centerpiece that captures the original band’s moment of transition from its psychedelic roots to state-of-the-art jazz-rock. Roy Babbington (who guested on Fourth, though not on “Kings and Queens”) is a discreet but unmistakable presence, his finely-honed synergy with John Marshall’s impeccable drumming in evidence right from the opening strains of the title-track – which later develops into an intriguing “conversation piece” between sax and guitar. The upbeat sax intro to “Voyage Beyond Seven” briefly dispels the previous number’s elegantly laid-back atmosphere, before going into a sort of slow-motion that culminates into a rather chaotic, spacey jam with sudden flares of volume. The deeply atmospheric Etheridge showcase of “Kitto” leads into the slow-burning, jazz-blues saunter of “Pie Chart” – an unexpected but welcome deviation from the band’s heady yet somewhat lofty stylings, as is the bracing boogie-rock of “Pump Room”, with Etheridge delivering a barrage of rough-and-ready riffs and scratchy, distorted chords, aided and abetted by Travis’ buoyant sax. “Black and Crimson” is all about melody Soft Machine Legacy-style, with an almost Latin feel; while the nearly 7-minute “Fallout” sandwiches a loose, improvisational section between a brisk, sax-and-guitar-driven main theme, bolstered by Marshall’s dramatic drum rolls. The album is wrapped up by the noisy avant-garde bash of “Green Cubes”, followed by the spacey, meditative strains of “They Landed on a Hill” – a finale that, in a way, represents the album’s two souls. 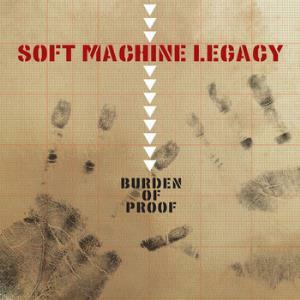 Those who have followed Soft Machine Legacy and its previous incarnations for the past two decades will find a lot to love in Burden of Proof, an album that combines melody and ambiance with the almost carefree abandon of improvisation. The four members of Soft Machine Legacy draws upon their individual strengths, striving to create music that, while sophisticated, is also not too detached from the earthiness of rock. Though the amount of improvisation may put off those who prefer their music to be scripted, and the minimalistic approach to composition may be found unsatisfactory by fans of prog’s more convoluted aspects, the album captures a group of seasoned musicians who obviously still enjoy themselves both in the studio and on stage. Even if sometimes demanding, Burden of Proof is also a consistently rewarding listen.